Well, first off, this isn't a mod - it's a suggestion. And secondly I used those images because they were fitting renditions for what I was suggesting. If it ain't broke, don't fix it, ya know? I think these would be cool. However they invade the vanilla feel of things in a negative way. They at least need to be more rare than the occurrence of charged creepers. My reasoning is that in the vanilla game its very much so undetailed- everything is compensated into blocks that are 1 meter by 1 meter. The birds- they shouldn't be mobs but more like a default generated particles. That dumbs things down but it's the most practical. Small mobs are unnecessary. I am conscious of bunnies, chickens and silverfish, but things very small just aren't fixated for a world where 1 meter by 1 meter of land is compressed into a single generic piece of land. Everything has to scale. That said wasps- they'd be cool but not as mobs or genuine tiny mobs. Things with smaller hitboxes apart from being hard to hit are kind of taking a scale and charm from the game. Those charms are hidden rules the devs use when implementing things. With the right balance from them I'm sure they'd make any of these work. I'm giving full support. I do however find that they'd be unlikely to be implemented at your current descriptions. I like your take on these. Before I begin this, let me say that I don't expect these to get implemented into vanilla Minecraft. Isn't this why everyone posts here? I don't expect some modder to make these. Good, this isn't the Modder suggestions forum. The reason I am making this thread is because it is obvious that rarer mobs are something the general community wants, 100% and I wish to offer up my ideas and see what people think. The Roc spawns very rarely, and is more or less like an Elder Guardian of the Ocean Temples in the sense of being a mini-boss. Living at the top of mountains - only when the mountains exceed a height of 150 - a roc is fiercely protective of its territory. Upon your arrival, it will follow a method of attack similar to that of an Ender Dragon: swooping and diving at you, but occasionally changing direction to avoid arrows and such. The Roc will drop 4-5 red feathers. Red feathers will serve as helping to make unique arrows, given the chances of unique arrows in the upcoming Combat Update. My personal thoughts is that Red-feathered arrows do slightly more damage than regular ones, or perhaps have a natural Knockback I force. Why not? It is at human height, but looks like floating, transparent armor carrying an iron sword. The phantom knight will spawn very rarely in dungeons. It is transparent and can travel through walls, emitting a ghastly wail that sounds a bit like the knight is still challenging its old foes. Arrows merely bounce off of it; only a sword can deal damage to this fiend. The phantom knight will drop a glowstone block – its lost soul Spooky – in addition to offering the chance of dropping its iron sword/armor. What is it's armor? Does it have unique armor, iron armor, chain armor?? The coelacanth will be a very rare mob – far rarer than any of the current mobs. It will actively go after chickens if they are in its pool of water; after eating a certain number of chickens, the coelacanth will grow in size until it is as large as a cow. I don't like that part. At this point, the coelacanth will either continue to attack chickens – in addition to pigs – or will get stuck on land and die of lack of oxygen. The coelacanth’s drops are what make it special: a fossil block. I don't think you get fossils from still living creatures. Fossil blocks can take the form of a head, torso, or tail fin, allowing the player to place them as a form of decoration in their homes. I might like that, just not from creatures that were still alive.. Fossil blocks, when placed in the crafting grid alone, will form 3 bones, kind of like how 1 bone makes 3 bonemeal. So 1 fossil gives you 9 bonemeal, essentially. The scorpion is a spawn that occurs infrequently compared to the Ghast and zombie pigmen. Appearing in groups of 2-3, it is like any other Nether mob incapable of being harmed through fire. They will attack the player if he/she comes within range, snapping at the player with its pincers. Should its tail strike the player, the player will become poisoned. Scorpions, over time, will build hives, which will continuously spawn small Hornets. I liked the scorpion up until this part. So, even after the scorpion despawns/is killed, it can wreak a little bit of havoc and prove dangerous; left alive, it can provide an infinite source of some materials, if controlled. Scorpions will drop armor-plates, which can be crafted to create a new set of armor: plate-armor. Plate armor has the durability of iron armor, but automatically harbors a Fire Protection enchantment (in addition to being enchantable through other means); an incredibly useful tool for Nether warriors. Well I guess minecraft armor is pretty boring, you only ever use iron and diamond, and never use iron after you get diamond. About ½ the size of a chicken, hornets look like small flying insects with stingers. The hive is a 2.5-block high structure that appears like a stalagmite in the Nether. While they can exist on their own normally, this is incredibly rare; scorpions, however, can create hives with relative ease. I would rather them just spawn less rarely and have scorpions not create hives. Hornets will not spawn unless there is a hive nearby; if the hive is destroyed, no more hornets will spawn. Hornets are naturally-aggressive mobs that spawn in groups of 4-5. They will attack any other mob except the scorpion. Mob spawner + Hives + Hoppers = Yes please! They only do .5 hearts worth of damage per strike, but in a group, that damage can add up to kill the player off quickly. Almost any strike with a tool or weapon will destroy them. Hornets have the small chance of dropping armor plates; this chance is very small, however. Not so sure about this. Hives, when destroyed, can be picked up; thus, it is possible to place it in a mob trap that will give the player an infinite source of armor plates. Or just give them a different drop, you can already make mob farms extremely compact with this mob as it is. Hostility: Passive-aggressive That's called neutral. Looks like a regular tree, only it has roots with which it attacks. The Treant is a tree-like mob which appears occasionally in forest biomes. For the most part it is passive, and will not attack the player at all. However, should the player attempt to attack the treant– or cut down the trees around it – it will begin attacking the player with its whip-like roots. The roots will rise from the ground and smack the player, dealing 1 heart of damage per strike. A chance of 2-3 wood blocks (type dependent on biome), as well as 2-3 apples. I think it should have a unique drop..
Before I begin this, I realize that Mo’ Creatures has birds similar to what I’m proposing. But since Mo' Creatures is not in the vanilla Minecraft - and my ideas are slightly different from his - I am still including this. 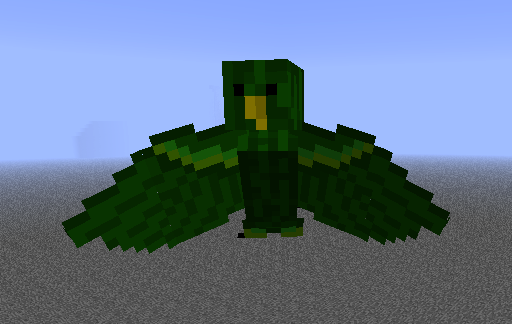 Characteristics – General: Birds will not offer too much as far as different gameplay, but instead will offer more of an aesthetic appeal to Minecraft; having different kinds of birds appearing in different biomes, offering background noise and helping to distinguish biomes from one another. Ocean: Seagulls will be slightly less common than most of the other birds simply because hearing their cry all the time would get annoying. Seagulls can sit on the water, are capable of flying, and walking around on the sand (they will actually avoid landing on dirt or trees). Ducks will also spawn, but in far fewer numbers and not nearly as commonly as seagulls. At night, they will either remain still in the water, or will stay still on land. Rainforest: While the rainforest biome is sorely lacking any distinction in the current Minecraft, with birds, that distinction might be at least a little bit more clear. Toucans and macaws will not be very common, mind you, but they will spawn often enough so that you can tell that you’re in the rainforest. At night these birds will sit in the trees, unmoving. Snowy biome: Owls will appear in the snow biomes. During the day they stay in one place, but once the sun sets they fly around and hoot and everything. Desert: Roadrunners will appear in deserts. They do not fly, but can jump up to two blocks high. They will leap atop cacti and sleep there at night, not taking damage; if you destroy the cacti while they are sleeping, they will run off and try to find another one. Forest/Grassland: Cardinals, blue jays, and doves will be fairly common in these biomes, but chickadees will be far more common than the others – being about as common as current animals. At night they will sleep in the trees. When slain, all of these birds will only drop 1 feather. A larger, thicker-coated version of the current wolf, with a more profound tail and detailed coat. The winter wolf is an untameable variation of the current wolf. Like the regular wolf, the winter wolf will hunt down sheep, in addition to pigs and chickens. If the player should strike the winter wolf, it will attack the player; other winter wolves will also attack the player within a certain radius. Winter wolves will drop wool like a sheep, though they cannot be sheared like one. 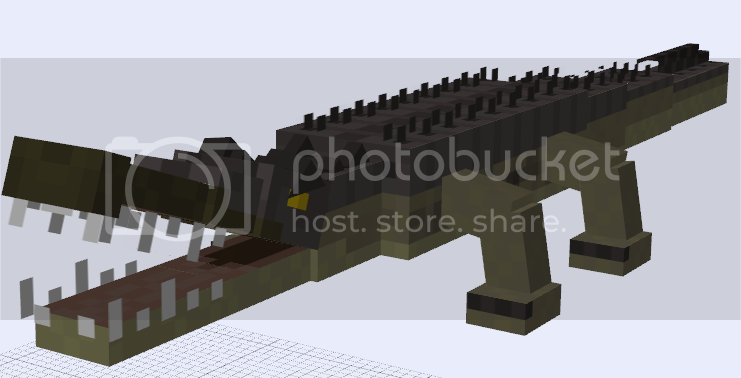 Well... it looks like a crocodile, only with Minecraft's blockiness. Is there anything more that needs to be said? The crocodile would be a hostile mob that appears occasionally in small bodies of water - meaning lakes and rivers compared to oceans. If it sense the player in its same body of water, it will begin swimming towards the player and attack. It will also follow the player on to land, but only for 10 blocks or so. Movement in the water will be twice that of the player, whereas on land it will be half that of the player. The crocodile does 2 hearts worth of damage per attack. In addition to attacking the player, the crocodile will also attack any passive mob that enters its body of water except for squid. The crocodile will almost always drop a raw fish, but sometimes will drop armor plates, as well. It wouldn't make sense if it dropped the same armor plates as scorpions, since those are fire resistant, and having two different armor plates is ridiculous. It would appear similar to the pig, only the body would be larger, it would be a dark brown color, and it would have small tusks jutting from its head. The wild boar would act like a pig for most of the time, wandering around and grunting. However, boars are fiercely territorial; should the player enter the territory and linger, the boar will lower its head and charge. It's a lot like the little piggy monsters in Twilight Princess (I have no idea what they're called xD); Boars? they charge in one direction until they strike something. If they strike dirt, wool, reeds, cacti, or sand they will break the block and stop moving; all other blocks will remain standing. If they strike the player they will do 2 hearts of damage and knock the player back farther than most normal attacks. Because of their similarity to a human, boars will also attack zombies should they enter their "territory" (basically a 10x10 area around the point in which they spawned). Zombies will be unable to fight back against the wild boar and will most certainly perish. The wild boar will drop uncooked porkchops always. If you have any ideas, post them kinda in the same format I have, and if they're good I'll put them in the OP (giving credit to you, of course). 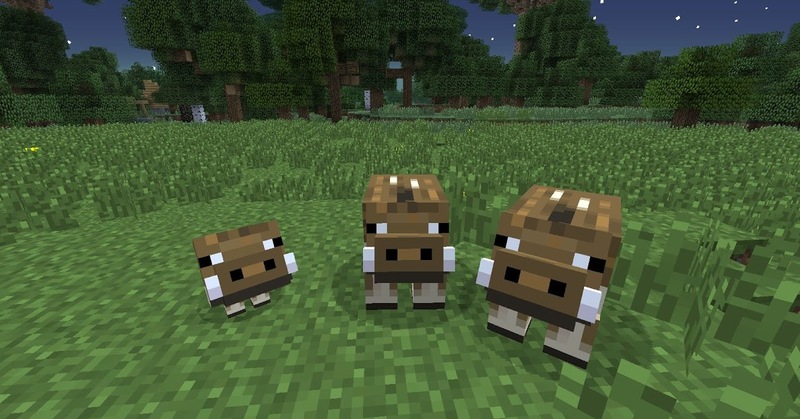 All of the images for these mobs come from other sources, most notably mods from people who have had similar-ish ideas. OP has been updated to reflect the current version of Minecraft, due to the (deleted) resurgence in interest. Let me know what you think! I am more than willing to add more ideas if I think they're good enough and fit with the others on here.